Plastic Molding Technology Inc. (PMT; El Paso, TX) announced new investments to expand the company’s molding capacity and capabilities. 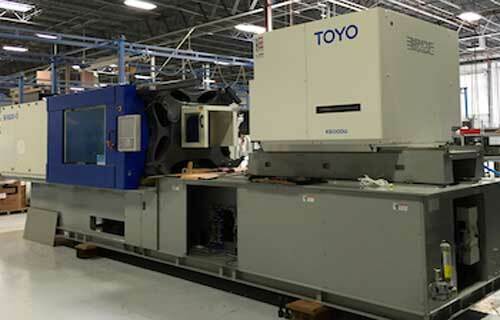 PMT’s investments include a new all-electric injection molding machine, along with a crane system and auxiliary equipment, to support new projects and an expansion of growth in key market segments. The machinery and auxiliary equipment investments were made as part of a $1.5 million facility-wide improvement project planned through 2017. Representing a move into a new tonnage range, PMT installed a 500-ton Toyo Si-500-6, which is currently the largest press at PMT. The Toyo has an integrated touch screen programmable logic control system, and is outfitted with 3-axis robotics and a NovaTech dryer system. To support this larger tonnage press, PMT also invested in a 5-ton overhead crane system, installed to ensure safer and faster mold changeovers. With a lift capacity of up to 10,000 pounds, the crane system is the largest yet, and will support the 500-ton press as well as two existing 390-ton machines. The 500-ton press will support new projects with a current automotive customer, while growing PMT’s business offerings in molding larger parts for both new and existing customers. PMT also invested in two 200-ton EC200SXV50-8s from Toshiba Machine. The twin presses free up capacity for molding demand in this popular tonnage range, and give PMT a boost of efficiency for technical molding applications. Both presses were outfitted with new auxiliary equipment, including NovaTech NovaWheel desiccant dryers and custom 3-axis robotic cells, according to PMT’s information. PMT’s machinery repertoire previously focused on smaller-tonnage presses, more than 60% of which historically are under 110 tons. The addition of the 500-ton press gives PMT increased flexibility in the size of parts produced at the facility. PMT operates on a 24/7 schedule, running 59 injection molding machines ranging from 40 to 500 tons, producing more than 150 million parts annually. More than half of all presses are now efficient all-electric models.